The university where I work recently redesigned its main dinning commons. 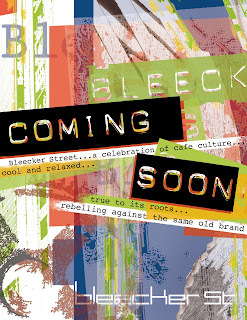 The design includes a new café called "The Bleecker St. Cafe." This continues to amuse me. I do not know precisely what is supposed to make a little kiosk selling sandwiches, coffee, and juice in New England reminiscent of Greenwich village. Is it the hummus? I have given the place the slogan: "Urban dining in a safe food court atmosphere." "The concept of immaterial labor refers to two different aspects of labor. On the one hand, as regards the “informational content” of the commodity, it refers directly to the changes taking place in workers’ labor processes in big companies in the industrial and tertiary sectors, where the skills involved in direct labor are increasingly skills involving cybernetics and computer control (and horizontal and vertical communication). On the other hand, as regards the activity that produces the “cultural content” of the commodity, immaterial labor involves a series of activities that are not normally recognized as “work”—in other words, the kinds of activities involved in defining and fixing cultural and artistic standards, fashions, tastes, consumer norms, and more strategically, public opinion." Now, I am interested in this idea of the hegemony of immaterial labor; that is, I think it makes it possible to grasp many of the economic and cultural transformations of capital. While I think it is true that commodities have become inseparable from their cultural content, and to some extent the "Bleecker St. Café" testifies to this, otherwise it would just be labeled "Food court," it also reveals how absolutely ineffective and laughable some of this cultural work actually is. It is not just a matter of this particular food court, we are surrounded by poorly named and designed commodities: housing developments with names like "Whispering Pines," which can only refer to the trees that were destroyed to make way for the houses, and food courts with nautical themes in landlocked states. So my question is where does this leave us: in the realm of the spectacle, where signs are completely separated from what they signify, and the Leaning Tower of Pisa is just something on the menu. Or does the gap between the commodity and its image make possible something, some critical strategy, other than inexhaustable and insufferable irony? In the name of full disclosure I should mention that I eat at the Bleecker St. Café quite a lot, at least whenever I forget to pack my lunch. I recommend the hummus/feta sandwich with the chips, you gotta get the chips. It beats the veggie burgers I used to eat at the old generic dining commons.